You have to ride Rabbit Valley #2 Trail (see description) to access the Western Rim trail. After you decend the flat area near the end of RV #2 Trail, stay left. When it really starts to decend (and I mean decend), keep an eye out for a right turn that goes to another steep decent down to a bench - that's the Western Rim Trail. This trail has arguably the best scenery and rim riding in the area. The trail is still used by motorcycles, but not that much (and not nearly as much as RV#2). Not very technical, but it has it's spot. This trail eventually hooks up with the Kokopelli Trail that returns one bench above and returns to RV #2 below the flat area. Ride the Rabbit Valley #2 and Western Rim for a 20 mile ride!! Check out the area guide books for explicit directions. This is one of the few rideable trails when wet, along with RV #2.
Review: This is one of the most scenic places to visit. Well worth the effort. The trail travels the rim overlooking the Colorado River. There is a little bit of a climb to get to the rim and you share the trail with ATVs on the way out. On the rim we did not see any ATVs. We did the rim on the way out and on the way back to take in all the views. About a 20 mile round trip from the parking lot. Review: Awesome views! Fun ride. Review: My fiancÃ© and I did #2 trail to connect to Western Rim out & back. We started at McDonald Parking lot because we were a little short on time. It was 14 miles (McDonald to just about heading out of the Western Rim bench to Kokopelli trail) . We loved this combo, amazing views, good flow section's, some nice technical stuff too. The ride back was for sure the highlight! Fun, fast, flow, pump! Review: Great trail. Ride Rabbit Valley #2 out instead of the road. It will cross the road a few times. At the end of Rabbit Valley #2 you can ride straight across Kokopelli to get to Western Rim. It's kind of hard to find this way or you can just take a right on Kokopelli and there will be a sign to Western Rim. This trail is great. Just make sure you are paying attention to the trail and not the views while riding. It's relatively non technical, but things will sneak up on you if you're not paying attention. There are a lot of jumps and small drops to fly off of if that's your thing. There will be a little something for everybody on this trail. There are a few short steep climbs to get out of the rim. I turned right at the first road crossing back to Kokopelli, but it looks like on the map that you can keep going and get tons of singletrack in. I left the rabbit valley campground around 8 am and saw exactly 0 people once I got pass the further parking lot. Similar Trail: Steve's loop but better. Review: Super cool trail. Not overly demanding or technical, but nice and flowy desert singletrack with incredible views. Great rim-ride, not a ton of people. You feel like you're pretty far out there. Can log a relatively quick 15-20 miles between this and Kokopelli. Highly recommend it. Review: Western Rim has been one of my favorite area trails. For one it is just some awesome single track with great desert views. But, also because it was off the beaten path and not heavily traveled. That doesn't seem to be the case anymore. On a recent Saturday (May 2014) we must have passed 50 people on the trail with some very large groups over 10 riders. It is great that people are riding, but this trail is taking a beating....the single track is getting wider. Please remember proper passing technique! For those that don't know, one can't ride off the trail in the desert to let a rider pass. This damages the desert permanently, yes even if it is only done once the ruts do not go away and lead to more riders following your tracks. Please, stop with your wheels on the trail and lean to the side to let others pass. Help keep this trail and all of our desert trails awesome! Review: Take RV #2 to Western Rim. If you have 4wd, drive to Castle Campground and then jump on trail. 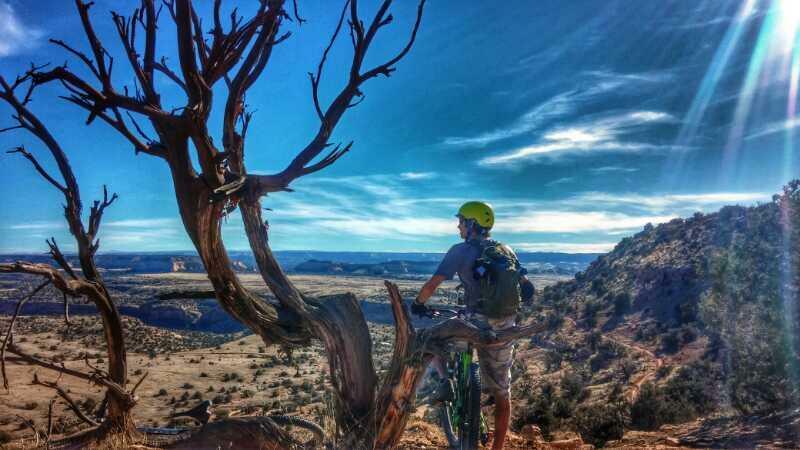 Most picturesque ride in the Fruita area. A couple steep sections getting there, but once there, smooth flowing single track around the rim overlooking the Colorado River. Take plenty of water - great ride! Review: Best when done as part of Holy Grail. Great scenery fun riding, the road to it can be sandy (powdered sugar) mid July not the best time. 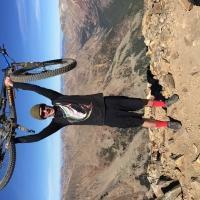 Review: Surreal trail - even by Fruita standards. The track itself is realistically not a "five star" ride, but the scenery and "out there" factor bump it up a notch. Did a bit of route-finding, backtracking - bring a good map if you're riding it for the first time. Also, if your vehicle has a bit of clearance, start at the closer trailhead - you're not missing anything on the two mile ride from the main Rabbit Valley trailhead to the last one. Western Rim MTB Trail 4.57 out of 5 based on 14 ratings. 14 user reviews.